You are currently browsing the category archive for the ‘laos’ category. This year I am not going to travel or do anything else particularly adventurous. This year, nothing special. Just this. Can I be comfortable with that? The truth is, of course, I don’t know what will happen this year. There could be big drama whether I plan it or not. I could get laid off from my job. My mammogram next week could produce results that would pivot my world on its axis. Don’t know. But I’m not going to intentionally cook up something to keep my excitement level (and my stress level) high. I have a tendency to do that. It’s mid-January, a time of non-eventfulness. As I gaze out the window at the cold, grey and white, the dullness of the scene mirrors my inner state. One step lower and it would feel like depression. Or would it? When emptiness threatens, I usually don’t give myself a chance to find out. I start a new project and get really busy. It takes mindfulness and self-restraint to just let things be instead of rushing in to make something happen. But that’s what I’m going to try to do. When we pay attention to the ordinary moments of life we sometimes find the extraordinary shimmering within them. But (from my more aged perspective) extraordinary is not something we really benefit from chasing after, trying to engineer, or (heaven forbid) contriving to be. And anyway… ordinary/extraordinary – what are they really but just thoughts? I can’t blame them. Monks are incredibly photogenic. And to a tourist’s eyes, including my own, the scene was exotic and extraordinary. We all felt the desire to grab a little of that spiritual vibe and take it home with us. It was worth traveling thousands of miles for, perhaps. But what was life like for the monks, these exemplars of specialness, of this extraordinary spirituality? Most of them had probably never ventured more than 50 miles from the spot we were in. Each morning they heard the same wakeup bell, chanted the same chants, ate the same white rice. Extraordinarily dull? I don’t think so. Just ordinary life, lived moment by moment. After my trip, what with the jet-lag and all, it has been taking a while for my mind to settle down. I keep jumping from memories of Laos to future fantasies about the next trip I want to take. The everyday life to which I have returned seems pretty flat. But in Zen practice, everyday life is what it’s all about. Only by developing our ability to pay attention to what’s happening here and now, can we take in anything in a deep and satisfying way. And while travel makes this attention easier – the newness and strangeness jolt us awake – we can theoretically do it anywhere, anytime. So this Sunday morning, I decided it was time to corral my jumpy, foggy mind, and try to be more mindful. I sat for a good while…my first decent meditation all week. And then John and I took a walk to Millway Beach. “Let’s be silent while we walk today,” I suggested. I wanted to to try attend to the subtle sounds and smells of impending spring, and to enjoy some quiet companionship instead of spinning off into ideas and yakking. Near the beach, we passed over the bridge where the water flows from the harbor side into a deep pool fringed by marsh. We paused and looked over the railing for a moment at the turbulent inflow of tide. Suddenly in the pool below there was a flash of motion. A small dolphin breeched the surface with a huff, and disappeared. About 30 seconds later it appeared again, and then again. We stood for about ten minutes watching it circling the pool in graceful arcs. This was a marvelous and surprising and anything I’d seen in Laos. I could feel myself starting to get anchored back in the here and now. 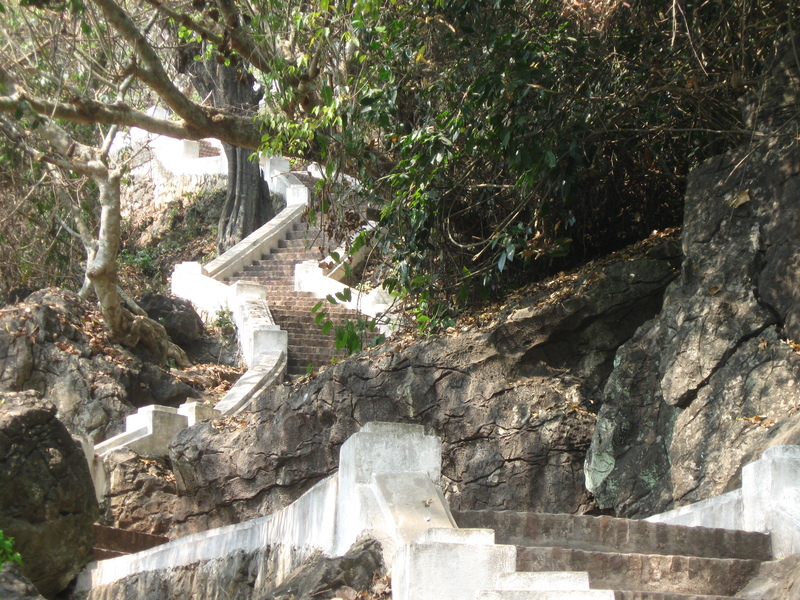 On our last full day in Luang Prabang in Laos, I decided to climb Mt. Phousi, a tall sacred hill in the middle of an otherwise flat town. It was already a hot morning and I knew the hundreds of stone steps to the top would be a cardio workout, so I took it slowly, resting frequently and admiring the view. At the top, I found a small Buddhist temple with a vendor outside selling drinks, incense, flowers and other offerings. I seated myself on the cool tile floor of the temple and watched the locals and tourists come and go. Three young Lao women dressed in jeans and t-shirts came in and kneeled before the altar. They made prostrations, lit candles and incense, checked their cell-phones, giggled, and prayed. Then one of them picked up a small bamboo cage purchased from the vendor outside that contained two frantically cheeping little birds. She pressed it to her forehead and shut her eyes for a minute. Then she went outside to the parapet, where she pried open the cage and released the birds. They swooped away joyously. What a lovely gesture of kindness to all creatures! And how odd that birds are being trapped for this purpose. Or perhaps these fortunate birds had come from the market, where most were sold for food. Apparently there aren’t many songbirds left in Laos, because so many are eaten. Whatever. I purchased my own little pair and released them. They were very happy to be freed, and not the least bit concerned about the ambiguity of the situation. A week into our trip, and I just stumbled across some notes I wrote a few weeks ago when I was feeling anxious about the trip. I listed a few worse-case scenarios, and then my reasons for going: to get outside the bubble of my own culture, and see if I could be comfortable there. To experience the gentle Buddhist vibe of this lovely country. And in spite of some moments of anxiety melt-down, it’s very much come to pass as I hoped. Last night we witnessed a beautiful ceremony at our local wat, which takes place on the February full moon. A huge drum was booming and hundreds of monks and laypeople were circling the main temple carrying candles and flowers. The whole place was festooned with christmas lights and candles. And strangely, inside the most sacred heart of the temple, they were screening a power point show about the evils of smoking, featuring dogs and chimanzees with butts hanging out of their mouths. Go figure. Anyway, it’s a strange and wonderful place, a strange and wonderful world we live in. In a week and a half, God willing and the creek don’t rise, I’ll be on my way to Laos. When I tell people about my trip, they usually look puzzled. “Why Laos? Are you going for business, or is it a vacation?” I hesitate a moment. The word vacation just doesn’t seem to fit. Finally, I say, “It’s travel.” As to why…well, it seems important to get outside our cultural bubble every once in a while. 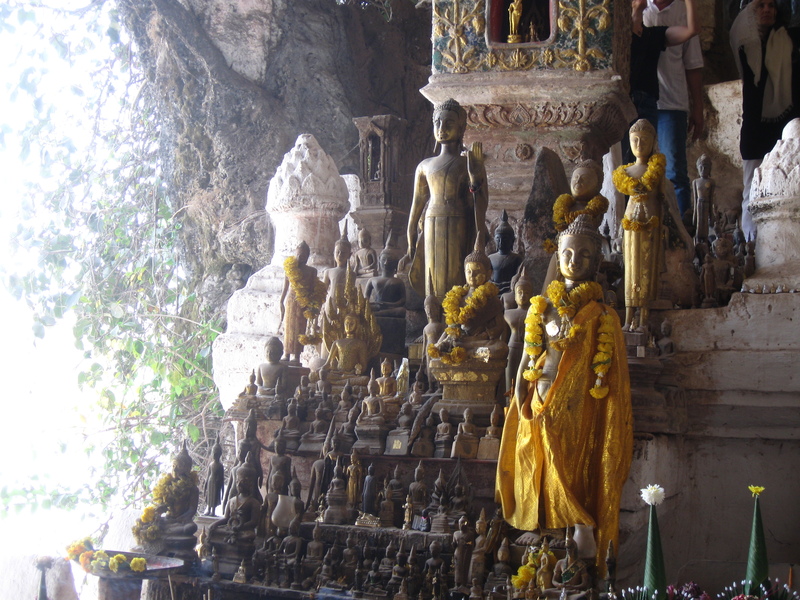 Laos is a deeply Buddhist country with a laid-back manner and friendly people. It also happens to be very hot right now, both in the temperature sense and the trendy sense. Since buying my ticket, I’ve seen Laos on half a dozen must-see lists. It’s not often I find myself on the cutting edge. Let me say right up front, I’m not an intrepid adventure traveller – but I’d like to be. Perhaps this is my version of a sixty-year-old guy buying a silver BMW convertible to prove he can still be the person he wants to be. As it is, my feelings about this impending trip alternate between pleasurable excitement and insomnia-producing anxiety. There are endless thoughts about Things to Do (find the pin for my ATM card), Things to Decide (travel insurance…yes or no? ), or Things That Might Go Wrong (a snowstorm on the day of departure! ), each delivering a little jolt of adrenaline to the solar plexus. It’s what happens to me when I face the unknown. Lately I’ve been reading One Foot in Laos by Dervla Murphy. She’s a super-intrepid traveller, a weather-beaten Irishwoman who trekked around Laos alone when she was 66. I’d love to have half her guts, but that’s not me. I have to accept being a traveller who’s half intrepid, half chicken.